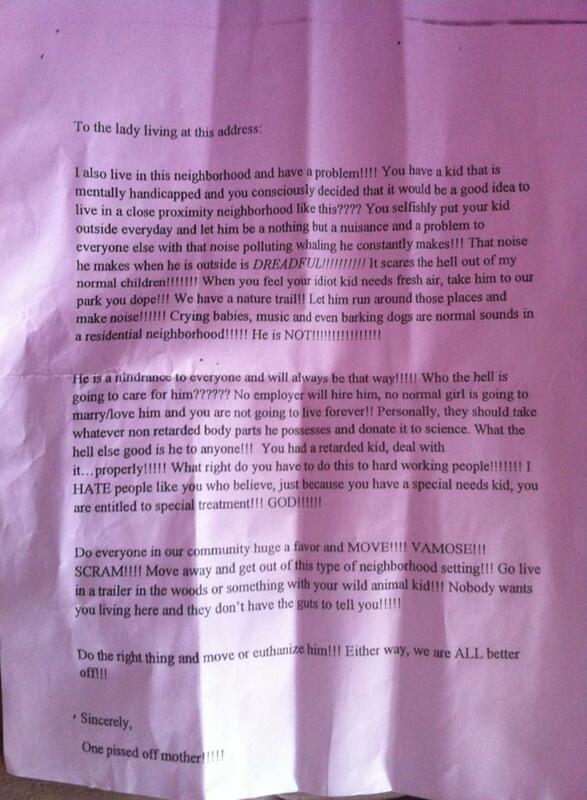 Whoever wrote this letter is obviously an extremely troubled individual. It would be incredibly easy to get angry and start crying out for her to be punished for it, but decisions made in anger often lead to regret. What kind of person thinks like this woman? A miserable one. She’s being punished already simply by living her life. She won’t become a better person with the addition of more pain. Many would say they don’t care about making her a better person. They want her hurt to make them feel better. Hurting someone else to feel better is what the writer of this letter did. She thought that somebody deserved to be put through pain, so she lashed out just like you might be thinking about doing. But there is a difference, you might say, between them. The mother of the autistic boy did nothing to deserve punishment. The letter writer would disagree. In her judgment, the mother was doing something wrong. In your judgment, the writer did something wrong. In both cases, the answer to a crime is another crime. Hurting other people on purpose is always wrong no matter who you are, no matter who they are, and no matter what they did. If you went back in time and punched Hitler in the face, you would be doing something bad and probably creating paradoxes for The Doctor to iron out. Shame on you. He has enough to do without you messing with the space-time continuum. Justice means dealing with people in a fair way, not hurting them so you can feel better. In order to break the cycle of hate, you have to deny yourself the expression of your anger. Don’t scream, don’t hit a pillow, don’t fantasize about the letter writer getting her comeuppance, and don’t write an angry reply wherever you first saw this posted. Whatever you want to do, don’t do it. Take a deep breath or two and consider that aggressive words and actions are the resort of people who are already in pain, and inflicting more pain on them will do nothing but cause them to amp up the aggression. Imagine how you would feel about someone going through pain who did not behave aggressively toward others. That is how you should feel about her. She needs for the pain to stop. She needs help. The power to spread pain comes easily to those who call upon it, but the power to heal is much greater and much harder to summon. If you want to make the world a better place, show compassion for everyone who hurts. Start with yourself. Here is the response from the lady who received the letter. Your letter has left me feeling terribly sad. Not for me, or for my son Maxwell — that’s his name by the way, not “retard” or “wild animal kid” — but for you. In reality, I will never share your thoughts with my son, because he is a happy child who brings an incredible amount of joy to those who know him. And while your words were very hurtful to read, the support I receive from my family, friends, and my more understanding neighbours lifts me up on a daily basis and outweighs anything you could ever say to me. The fact that you have chosen to address me anonymously gives me some insight that somewhere deep down, you know that what you wrote to me is wrong, and that gives me hope. Because those who know that they’ve done wrong sometimes want to do better, I want to help you know my son. Perhaps then you will open your heart to the beautiful person he is. If not, I will at least know that you have been provided with the opportunity to become educated, and that maybe something good will come out of your negativity and misguided hatred. Maxwell has a diagnosis of autism. He is not “mentally handicapped” or “retarded”. Autism is a disorder of brain development characterized by difficulties in social interaction, verbal and nonverbal communication, and repetitive behaviours. The noises he makes that you describe as “dreadful” are in fact the way he expresses happiness. He loves being outside, and shares the right to enjoy the outdoors just as you or I do. Perhaps you find his form of expression unpleasant, but if you took the time to meet Maxwell and got to know him, I would like to think he could bring a smile to your face. Maxwell loves jumping on his trampoline, playing on his iPad, hanging out with his family, and reading books. Most of the time he has a smile on his face, and he has never said a cruel word to anybody. You could actually learn a lot from him. Because of the lack of empathy in your letter, it seems likely to me that you have not had the privilege of having a close friend or family member with special needs. This is a great shame for you and your “normal” children. You do yourself and them a disservice by limiting who you interact with. There is no reason to be scared. In fact, people with special needs have much more reason to fear intolerant individuals such as yourself. My son is a gentle soul who would never want to hurt anyone — physically or with hateful words such as the ones you typed in that letter. If you need me to put that in simpler terms for you, the law states that Maxwell has just as much right to live his life without being discriminated against as you do. If you have a problem with that, it seems to me that you’re the one who should move to a trailer in the woods where you hopefully won’t be too annoyed by the sounds made by actual wild animals.